To escape with our daily routine during weekends, (that is eat-tambay-wash clothes-eat-tambay), me and my office buddies decided to have a little gig at E.K. Our aim is to defrost our sleeping nerves - frozen by work stress and boredom - via Enchanted Kingdom's nerve-wracking rides. It is an unplanned trip but well organized - hmmm I noticed that unplanned barkada trip is usually a hassle-free one. We decided renting an FX and bring our own food because stomach stuff inside the park can eat up your whole two-month's budget. Weather is a little bit crazy that morning. While we are on our way to E.K., dark clouds hung above us, a rain-whole-day omen. It started pouring while we are on our way to the park and we are already discussing some alternatives like going to Tagaytay instead. We are willing to do a space shuttle ride even if it’s raining – which is of course a little bit life threatening – thus, we decided to go and take our chances. We think that, perhaps we can perform a little stop-the-rain tribal ritual dance for some ethnic rain-god so as not to ruin our plans. But, yeah since the weather is a little bit crazy and confused that day, it decided to just leave us alone before we do some nasty tribal dance. I think the rain-god prefers to just leave us than see us perform the ritual dance or else she will give us a super-typhoon. We had our lunch in the parking area and immediately started our spree. We are all frantic and excited. 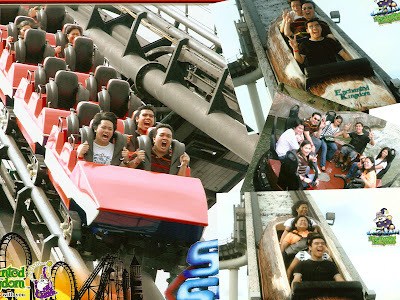 A ride-all-you-can ticket gives us the adrenaline rush which is evident in our faces. There’s no stopping us… even the rain-god. And there comes the nerve wracking, soul splitting space shuttle ride. My physical body badly wants that ride, but I felt my soul is angrily refusing it. Despite that, I took the ride - three times. In the first two rides, my soul just temporarily left me. During the third space shuttle ride, I felt like I totally lost my soul. We end up drained and exhausted but there’s that lingering smile in all of us .I got a dreamless sleep that night and woke up still wearing that wolfish grin . Overjoyed as Jo-ann puts it. To my soul… I’m sorry.